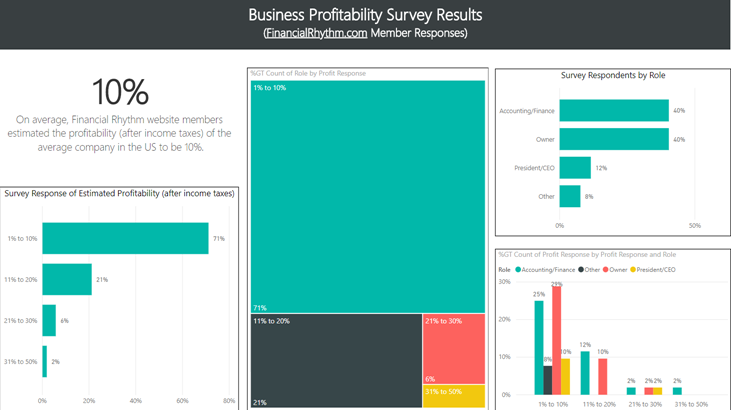 I created a fun survey recently to shine a light on profitability in business (and the perception of profitability in business). 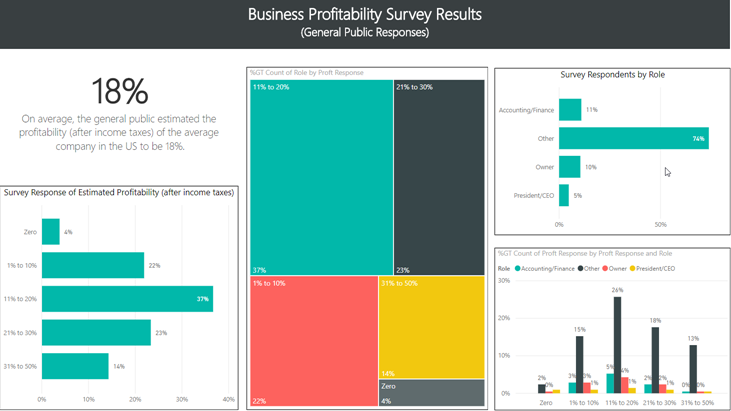 A dashboard with the profitability survey results is shown above. You can enlarge the report by clicking in the bottom right corner. And you can move to each of the 3 pages by clicking near the bottom center of the report. You can also click here to see an enlarged version of the dashboard. It was a super-fast, 5-Second Survey to get your view on profitability in business. You can take the survey real fast here. WOW! 36% profitability after income taxes isn’t even close to reality. On the one hand, it isn’t too big a surprise that the general public believes profitability in business is much higher than it really is. In some ways it fits with the view that is popular that business is filled with “greedy capitalists” that are making money hand over fist. On the other hand, my experience has taught me that even business owners don’t really know how profitable their business is. Or how profitable their business should be. 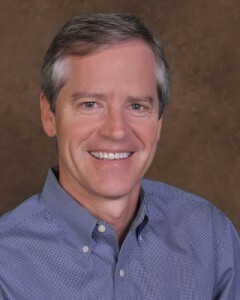 So, I decided to ask a very similar question of people who are part of my free membership group at FinancialRhythm.com. These are a mix of business owners and finance professionals who have read my books and follow my blog. They own and manage businesses or support and advise business owners. In a separate survey, I asked the same short question but used a service at Survey Monkey to send the survey to a general audience in the U.S. I wanted to compare survey results between a group of mostly business people and a more general, non-business audience. The results are shown in the dashboard at the top of this post. The image below is a screenshot from the dashboard. It shows a summary of the survey results for Financial Rhythm members. 71% of the responders chose the 1% to 10% category as their estimate for average company profitability after income taxes. Responders were almost evenly split between business owners or someone running the business and accounting and financial professionals. In order to arrive at a single percentage of estimated profitability, I created a (sort of) weighted average response using the mid-point of each range and the number of responses to each range. The result was on average, Financial Rhythm website members estimated the profitability (after income taxes) of the average company in the US to be 10%. The image below shows a summary of the survey results for the general public. Only 22% of the general public responders chose the 1% to 10% category as their estimate for average company profitability after income taxes. 37% chose the 11% to 20% category. Only 10% of the general public responders were business owners. 74% were “other” meaning they do not own or operate a business and they were not accounting or financial professionals. I calculated the same weighted average response using the mid-point of each range and the number of responses to each range. The result was on average, the general public estimated the profitability (after income taxes) of the average company in the US to be 18%. 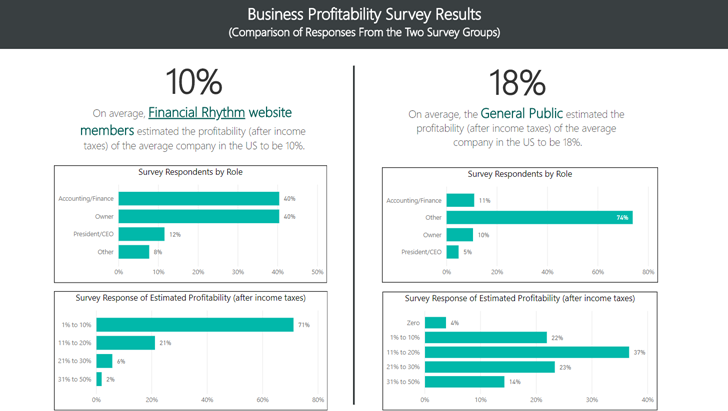 The image below shows a comparison of the survey results from Financial Rhythm members and the general public. The general public believes business profitability is much higher than business owners and their advisors. 18% vs. 10%. That’s a big difference. 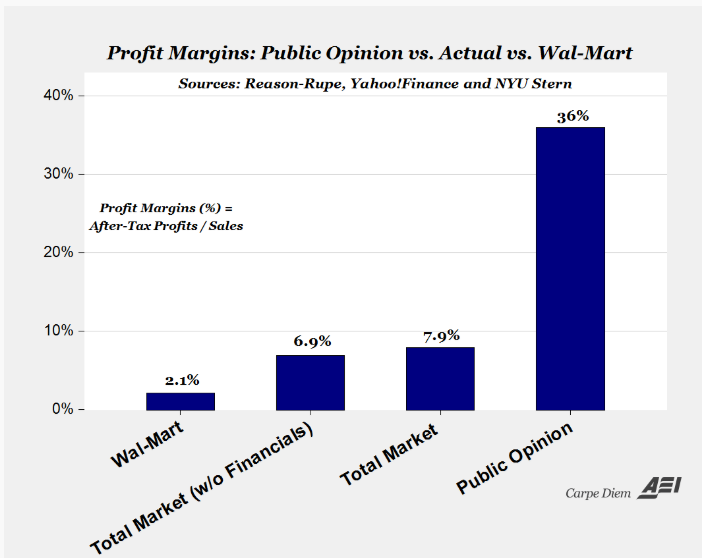 Although not near as big a difference as the survey I mentioned that showed an estimated 36% profitability. The actual average profitability among U.S. companies in 2017 is 8% profit after tax. Check out this dashboard I created of actual Profitability Margins by Industry across almost 100 industries and over 7,000 companies in the U.S. I will share a post soon where I show you some specific companies that everyone is familiar with and what their profitability margins are. I think you will find it very interesting to see what other companies are making as a percent of sales. I hope it will help you determine whether your profitability levels are where they should be. One tool that might help you is the 5-Minute Profitability Assessment. The purpose of the 5-minute profitability assessment is to help you quickly determine if your business is as profitable as it should be. The profitability assessment is an important part of the 10-step process for making your business financially strong. It will help you breathe financial life into your business if you believe your business is not as financially sound, or as profitable, as it should be. The profits you generate in your business, expressed as a percentage of revenues (sales), is a very important metric. A business that does not consistently produce strong profitability is a business headed for the graveyard. As my business failure rates dashboard shows, almost half of all businesses never make it to their 5-year anniversary. Only 35% survive to their 10-year anniversary. … and make running the business fun – and rewarding! I hope your financial improvement plans include action items related to driving revenues higher and expenses lower (and on ways to keep expenses from rising too fast). More businesses fail than survive in their first 10 years. About 50% of businesses survive to see their 5th birthday. Only 35% survive to see their 10th birthday. The flip side of those numbers is one-half of businesses fail in the first five years of their existence. And 65% fail in the first ten years. I’ve seen businesses fail and it is a gut wrenching experience… even when I had no stake in the company. It creates a feeling of pain and regret that sticks with you for a long time. I find those success and failure rates fascinating on several fronts. First, I learned very early in my business career that making money in business is hard. Being consistently and predictably profitable is a much bigger challenge than most people realize. Expenses are always rising. Your competition is gunning for your customers. You really have no choice but to constantly, and persistently, work on improving your financial results in order to survive and thrive in business. Ash Maurya, author of Running Lean and Scaling Lean says: “Making money is a skill”. 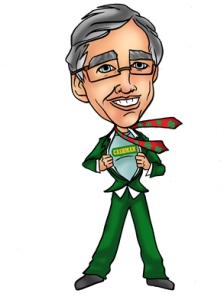 Getting and keeping customers… profitably, is a skill that requires constant attention and focus by the owner and management. It requires hard work and continuous improvement in every area of the business. 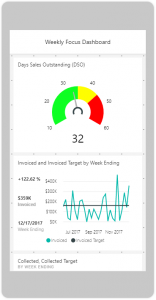 Second, most businesses with annual revenues of $10 million or less do not have a seasoned CFO defining and orchestrating the Monthly Financial Rhythm of the business. There is no one providing a service that I lovingly refer to as “adult financial supervision”. Compound that with sloppy financial management and you risk becoming one of those business failures statistics. Ultimately, your profitability and cash flow determine whether you survive and thrive in business. Make sure you have someone orchestrating the Monthly Financial Rhythm within your company so you put a laser focus on profitability and cash flow. 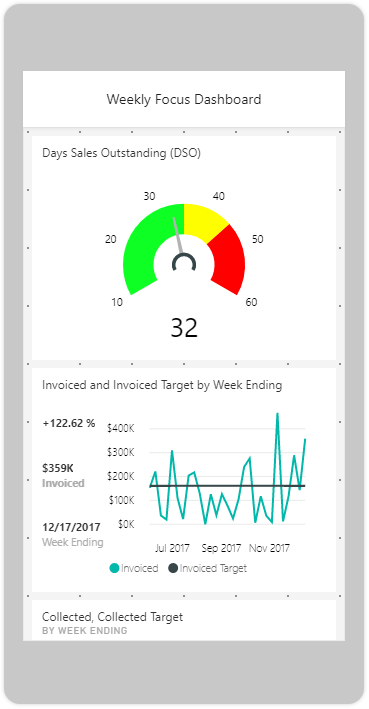 Use fun dashboards to help you manage and monitor financial goals and results. Make sure you have a clear view through the financial windshield of your business. I’ve always been goal oriented, especially when it comes to career, business, and money. But my favorite goals, the goals that have had the biggest impact on my career and my net worth, went contrary to the conventional wisdom of setting SMART goals. Specific – What specifically do you want to do or achieve? Measurable – How will you know when you’ve reached it? Attainable – Is it in your power to accomplish it? Relevant – Does the goal fit with your values or bigger picture objectives? Time-bound – When exactly do you want to accomplish your goal? Using SMART goals is a very effective approach to achieving results and getting things done. I use that approach regularly to achieve many of my business and financial goals. But there is something almost magical about having goals that are more aspirational in nature. An aspirational goal defies logic in many ways in that you can’t see a specific path to achieving the goal when you set it. You can’t explain each specific step that will get you to your destination. You’re not sure when, or if, you will attain the goal or not. You just know that it is something that is very important to you and you want to find a way to bring it into your life over time. As a young CPA back in my early 20s, I set a goal to make $30,000 by the time I was 30. That was back in 1984 when I was 23 years old. I was a year out of college working in a small CPA firm in Beaumont Texas. My income that year was $21,377. I had no specific path as to how to increase my pay by 50% or so. But I knew I wanted to make more money and 30 by 30 had a nice ring to it. So, I let my subconscious know I wanted to get there. In 1986, the college I had graduated from three years prior allowed me to interview with some international accounting firms that were coming to campus to interview new graduates. At the time, the Big 8 CPA Firms (as they were known back then) hired people right out of school rather hire experienced CPAs or accountants. By the end of 1986, I had convinced a partner at Arthur Andersen in Houston, Texas to hire me and take a chance on an “experienced” CPA rather than a new graduate. My pitch to them was to pay me the same money they paid new graduates (which was well below my $30,000 target) and I would show them in short order that I could add value at a much higher level. Once I proved I could do it, then I said I would sit down with them to see about increasing my pay to better match the value I was providing. I knew that my pitch would increase my chance of getting the job. And I felt that getting the job and being in the middle of the action in Houston, Texas would help me get the experience to develop my skills and ability to add value in business. And that was going to be important for me to ultimately hit my financial goal. My income in 1988, at 27 years old, was $32,430. I had beat the goal and the deadline. It felt good to set a goal then look back on all the interesting turns and twists that ultimately led to hitting the goal. And it also taught me to think bigger, and more aspirational, about my financial goals. My next aspirational goal around 1990 was to have a personal net worth of $1,000,000. At the time, I had what I jokingly refer to as a “not worth”. My personal balance sheet had more liabilities than assets. I had a negative net worth. LESS than ZERO! And there was no clear path to how to go from a “not worth” to a $1,000,000 net worth. It was more like an affirmation than a SMART goal. But it was very important to me and something I thought about often and something I taught my subconscious mind to work on for me. I wrote that goal down hundreds of times to make it a part of me even when I wasn’t thinking about it consciously. I later revised the goal to add “or more” to it because I realized that I did not want to put a lid of what I was going after. Goals are a process and a journey, not a destination. The real benefit of having goals, both aspirational goals and SMART goals, is progress. It’s about making progress toward a better you and toward a bigger and brighter financial future for you and for your family. When you envision what would make you happy, you begin to see more clearly what you want to do and have. You begin thinking directionally about the progress and improvement you would like to experience in your life and work. That’s one reason I enjoy homing in on the metrics that matter in business. And using those metrics to frequently define and monitor the 1 to 3 financial goals to focus on in any given month or quarter. My experience over the last 30 years has taught me that having one to three financial goals or targets that are front and center is very, very important to driving financial results in a business. Defining the key metrics, then “hooking them up” to your financial and improvement goals, is critical to making it easy to monitor and manage your progress (or lack of progress) toward achieving those important goals. That’s what the Monthly Financial Rhythm is all about. There is a natural rhythm to business and money. 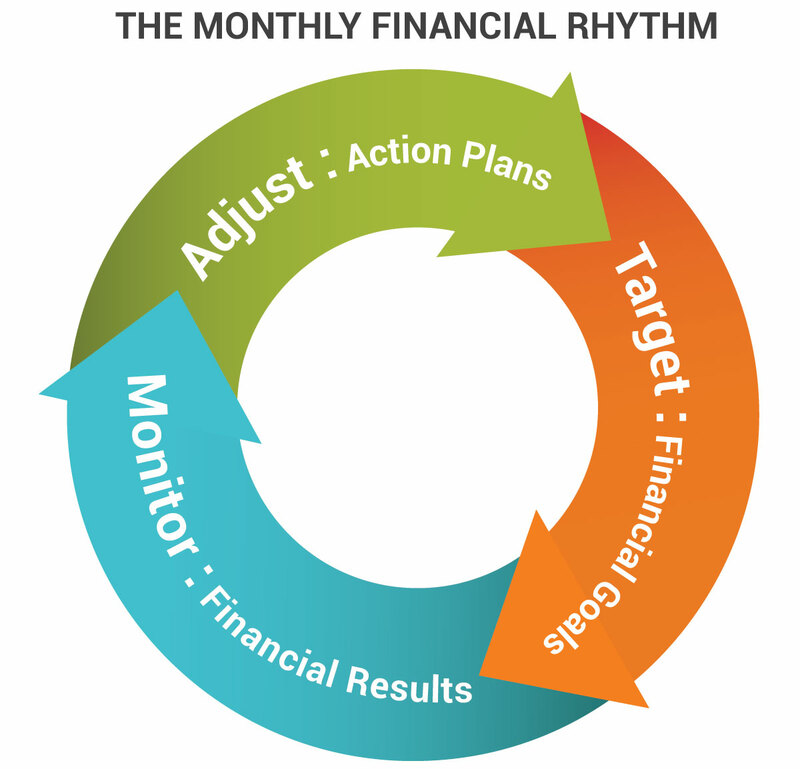 The Monthly Financial Rhythm is about orchestrating financial goals and targets and turning those into improved profitability and cash flow. It is one of the most powerful processes I have discovered for driving financial health, wealth, and freedom in business. And it all starts with identifying the 1 to 3 specific financial targets that you want to improve. And then setting goals to help you make it happen. Most of us believe we make good business decisions. Imagine for a minute that the quality of each of your important business decisions was measured and tracked every month. And that you were assigned a “batting average” that measured the quality of each of those important decisions. Does that sound scary… or exciting? Imagine a system where each person on your management team had a business decision “batting average” as well. Would that help you assess the value of each person on your team? Would it scare them to have a batting average based on the results of their important business decisions? We believe in postmortems at Berkshire. I mean, we really do believe — one of the things I used to do when I ran the partnership is I contrasted all sale decisions versus all purchase decisions. It wasn’t enough that the purchase decisions worked out well, they had to work out better than the sale decisions. And managers tend to be reluctant to look at the results of the capital projects or the acquisitions that they proposed with great detail a year or two earlier to a board. And they don’t want to actually stick the figures up there as to how the reality worked out against the projections. But, I think you’re a better doctor if you drop by the pathology department, occasionally. And I think you’re a better manager or investor if you look at every one of the decisions you’ve made, of importance, and see which ones worked out and which ones didn’t and, you know, what is your batting average. In the fantastic book Principles, Ray Dalio talks about a thought provoking concept he refers to as “believability-weighted decision making”. I have found triangulating with highly believable people who are willing to have thoughtful disagreements has never failed to enhance my learning and sharpen the quality of my decision making. To do it well, be sure to avoid the common perils of: 1) valuing your own believability more than is logical and 2) not distinguishing between who is more or less credible. This sort of principled and believability-weighted decision making is fascinating and leads to much different and much better decision making than is typical. While believability-weighted decision making can sound complicated, chances are you do it all the time – pretty much whenever you ask yourself, “Who should I listen to?” But it’s almost certainly true that you’d do it a lot better if you gave more thought to it. The most believable opinions are those of people who 1) have repeatedly and successfully accomplished the thing in question, and 2) have demonstrated that they can logically explain the cause-effect relationships behind their conclusions. When believability weighting is done correctly and consistently, it is the fairest and the most effective decision-making system. Every day is not a new day. Take an important decision like a capital expenditure or other large purchase or investment and document key management’s expectation of results. Then create a simple process where you sit down to evaluate results vs. expectation after six months, one year, eighteen months, etc. Rinse and repeat for future big decisions and see what you find. I bet you will find that some of your management team are better than others when it comes to the quality of their important business decisions… and outcomes. Is your business as profitable as you want it to be? And what is the best way to assess whether it is as profitable as it should be? Could I be more profitable? Do I have a revenue problem? Do I have an expense problem? Should I raise my prices? I have found that the best way to answer those questions is to use what I call the 5-minute profitability assessment. Create the 5-Minute Profitability Assessment (to determine what your profitability should be). The purpose of the 5-minute profitability assessment is to quickly determine if your business is as profitable as it should be. For example, in one company the owner was frustrated because cash was always tight despite the fact that they had made big strides in becoming profitable over the last two years. After completing the analysis, it turns out that profits were only 4% of sales in a business where the norm is closer to 10%. At $4,000,000 in revenues, that meant their Profitability Gap was $240,000 (10% – 4% x $4,000,000). Now that they had put a number on the profit improvement target (the opportunity), the mission became “closing the profitability gap”. The goal of this 5-minute profitability assessment is to come up with an estimate of what your annual profit should be (or could be). Your estimate doesn’t have to be right. It just needs to be a number you can write down. You will have plenty of time later to explore your estimate in more detail to determine if it should become your new profitability target. 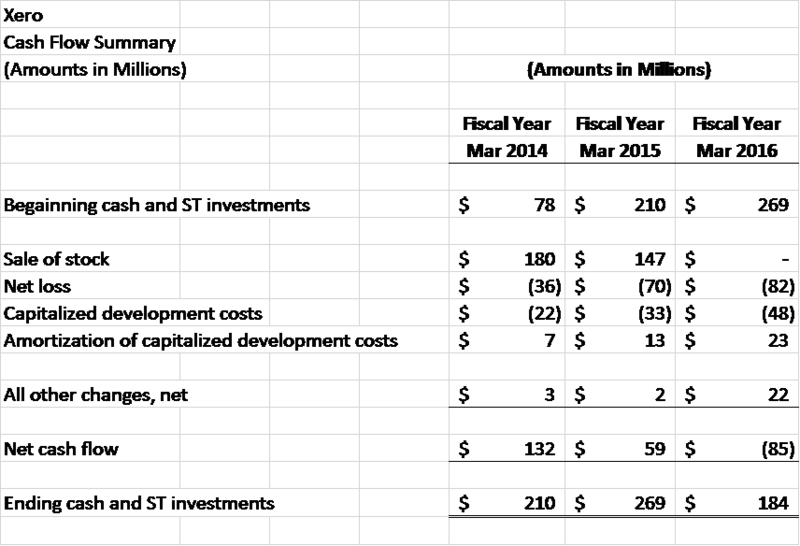 Look at your pre-tax income (your profit before income taxes) for the last twelve months. Divide that number by your revenues (total sales). Jot that percentage down. Let’s say that revenues are $10,000,000 and pre-tax profit is $500,000. So the percentage is 5%. Look at your gross margin (gross profit dollars divided by revenues). Use that percentage to lookup your pre-tax profit target range in the chart below. Let’s say gross profit is $4,200,000. So the gross margin is 42%. The pre-tax profit range in the table is 15% to 20% of revenues. Pick a pre-tax profit percentage in the range and multiply that times revenues. Write that number down. In my example, I’ll choose 15% (to be conservative). That number times $10,000,000 in revenues is a pre-tax profit target of $1,500,000. In this exercise, based on my example, the profit target is $1,500,000 and the actual profit is $500,000. The Profitability Gap is the difference, or $1,000,000. Remember, it’s just an estimate… for now. You will have time to more fully analyze that number later. Give it a try with your P&L. Imagine this. You walk out to your car first thing in the morning to drive to the office. You open the door… get in… put your seat belt on… and start the car. You wrap a blindfold across your eyes and tie it around the back of your head so you can’t see anything. Then you put the car in reverse and begin your journey! How far do you think you will go before you hit something? Not far, right? What’s interesting is that the same entrepreneur or business owner that would never put a blindfold on while driving their car is essentially doing the same thing every day when it comes to running their company. They are hurting their profitability and cash flow (and creating stress and frustration in the process) because they are cruising along on the highway of business with a blindfold wrapped across their eyes. The question isn’t whether there will be an accident. The question is how bad will the crash be… and will the business survive it. The cure for this problem is to implement one of the most powerful tools in business – a reliable financial forecast. 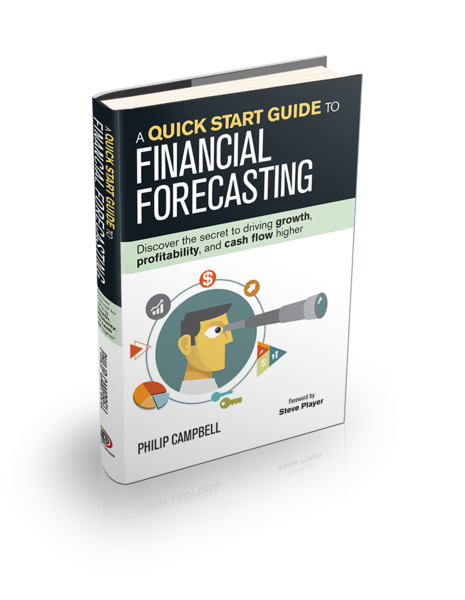 In short, a reliable financial forecast will help you win financially in business. Stand up and cover your eyes with both hands so you can’t see anything in the room. Now walk to the other side of the room without uncovering your eyes. That was uncomfortable wasn’t it? Even in a room you are very familiar with, it is uncomfortable trying to do a simple thing like walk to the other side of the room when you can’t see anything in front of you. Now let’s try that same experiment again, but with a twist. This time separate your fingers just a wee bit so you can peek through your fingers. Now walk across the room. Much more comfortable isn’t it? That little bit of visibility is enough to prevent you from running into something. That’s what a reliable financial forecast (a financial projection) is all about. Not providing complete visibility or certainty. Just providing a glimpse of what lies ahead so you can get where you are going safely. By “reliable,” I’m referring to unbiased, reality-based expectation of financial results that is designed for decision-making (not precision). By “financial forecast,” I’m referring to a full set of forward-looking financial statements (income statement, balance sheet, and cash flows) that includes a 2-minute summary. A reliable financial forecast solves this problem by providing a clear view through the financial windshield of your business. It creates the visibility and clarity you need to drive your company toward a bigger and brighter financial future. Put yourself in the driver’s seat of your business by tapping into the unique and exciting benefits that financial forecasting can unlock for you. A Quick Start Guide to Financial Forecasting, will help you create the view through the financial windshield of your business. Learn more here. Let’s take a look at how financial forecasting fits into the monthly financial rhythm of business. Business moves in a rhythm, a cycle. So does financial management. I call it the TARGET, MONITOR, ADJUST cycle. It’s about setting financial goals and targets, monitoring forecasts and actual financial results, and making adjustments in strategy and execution inside the business when financial results differ from the target or expectation. The cycle continues every month by making any necessary changes to the financial goals and targets and the resulting forecast/expectations. It’s a Monthly Financial Rhythm designed to help you focus on what matters most. It’s the key to turning financial information into insight… and improved profitability and cash flow. Creating a reliable financial forecast does not have to be a difficult process. It is really a matter of using a few basic principles together with your intuition and knowledge about the business. Here is a summarized version of the 10 rules for creating a forecast you can trust. Forecasting Rule No. 1: Think Decision-Making, Not Precision. One thing stopping you from creating a forecast is thinking that you don’t know exactly what the future holds and what will happen if your forecast is wrong. As you create and use forecasts and projections, think decision-making, not precision. Forecasting Rule No. 2: Think Top-Down, not Bottom-Up. Forecasting uses big-picture drivers and assumptions to create a model of what the financial statements may look like based on existing trends and plans. You have to take yourself up to the 30,000-foot level and look down on the business financially as you forecast. It’s about painting a picture of what the financial results will likely be based on your knowledge and intuition rather than actual transactions. Your forecast looks at the strategic view and direction of where the company is going—not the nitty-gritty bottom-up details. Forecasting Rule No. 3: Model a Full Set of Financial Statements. A reliable financial forecast is a living, breathing tool that is updated monthly. The basic format should track with your existing financial statements (income statement, balance sheet, and statement of cash flows in the same format you use for monthly financial reporting) for at least the next six to eighteen months. Forecasting Rule No. 4: First Look Back, Then Look Forward. One of the biggest mistakes entrepreneurs (and CFOs) make in creating a forecast is to start with a clean slate. They pull up a blank spreadsheet and begin thinking about what the first month in the forecast will look like. The problem is you unhook your forecast from reality when you do that. The first step should be to drop in actual results for the last six to eighteen months (or more). Have the revenues and expenses been coming in the way you expected them to? Can you see a trend developing? Are you surprised by any of the numbers now that you are looking at the last six to eighteen months of actual results next to each other? Once you have a good view of what the financial results have been over the last six to eighteen months, you want to look at some of the factors that can make the next six to eighteen months vary from the historical results. That could include things like seasonality, a change in service or product mix, whether you will be expanding geographically, etc. Forecasting Rule No. 5: Understand the High-Level Company Strategy and Expectations. One of the benefits of forecasting is that it forces you to think about your company’s vision and strategy more deeply. For example, what are the three most critical goals or initiatives for the coming year? Is the company planning to grow slowly or aggressively? Are there plans to move into new markets or attempt to attract new customer segments? Answering these types of strategic questions forces you to step back and think about the big picture. If you have a CFO it helps him or her “get out of the ledger” and talk to management about their division’s goals or their department’s strategies. It requires you to talk to your board and trusted advisors to get their input and perspective. You will be surprised how difficult this advice is to implement once you begin creating, and regularly updating, your financial forecast. The number of potential rabbit holes you can dive into while forecasting is huge. With all the assumptions you have to make in creating your forecast, it is very important to think about one of the more counterintuitive facts about forecasting: The more detail you bring into the forecasting process, the more error you will create. The key to success in forecasting is to be always thinking about how to simplify, simplify, simplify…and simplify some more. Simplify the key drivers, critical assumptions, and how you interpret and present the results of the forecast. Forecasting Rule No. 7: Create a Repeatable Process. Because your forecast will be updated with actual results and the forecast adjusted every month based on current information, repeatability is very important to the forecasting process. The software tool you choose will impact the success of your forecasting process. The tool must include the underlying logic for forecasting (modeling) a full set of financial statements and perform a number of additional functions. (Chapter 6 in my book A Quick Start Guide to Financial Forecasting is titled Choosing Your Software Tool–Spreadsheets vs. Forecasting Software. This chapter helps you evaluate the pluses and minuses of spreadsheets vs. software tools). Forecasting Rule No. 8: Be Conservative. Because we know a forecast will not be perfectly accurate, the challenge is keeping it in the “ballpark” as a wildly inaccurate forecast will hurt your credibility. You do that by being conservative in your key assumptions. It’s like meeting someone for lunch. You agree to meet a good friend at a restaurant at noon. You set noon as the time to meet so you will both be there at about the same time. But despite the precise time you set, you know that both of you will not show up at exactly noon. The only question is whether you will be there a little before noon or a little after noon. Will you be early or will you be late? It’s the same for your forecast. Your estimates will not be perfectly accurate. You want to err on the side of being conservative. That way the surprises are pleasant rather than unpleasant. Forecasting Rule No. 9: Condense the Results to a 2-Minute Summary. Creating a reliable forecast and effectively communicating it to your audience starts with making the forecast results simple and easy to understand. Here is a helpful exercise that works especially well when implementing a forecast process for the first time. Imagine you will sit down with your board tomorrow morning. In that meeting, you will have two minutes to convey the essence of the forecast (key insights, implications, and assumptions) to him or her. That person will then step into another meeting with the company’s key shareholders and lenders to share his or her insight about where the company is going financially. Your mission: Ensure they can share the insights from the forecast with confidence and clarity. This exercise will force you to distill the insights and implications of the forecast down to what matters most so that you can clearly identify and communicate the most important high-level drivers and assumptions. Forecasting Rule No. 10: Start for Your Eyes Only. As you make progress in creating your forecast, it’s natural to want to begin sharing it immediately. However, keep it “for your eyes only”—at least to start. That means don’t sell your leadership team on the value of having a forecast, don’t talk to them about the assumptions or specifics as you create the forecast, and don’t send the results of the forecast to them—yet. Instead, spend a few months “beta testing” your forecast to learn from and experiment with the process before rolling it out to the management team or the board. Create assumptions at the highest level possible to prove to yourself that you don’t need to forecast at the detail level. Create the forecast for the next three months, then com- pare the actual results each month. What worked out well? Are you surprised at the difference between your forecast and the actual results? After running the forecast process for three months, you will become more confident and knowledgeable about the benefits of forecasting and how best to create and present the results. You will learn firsthand where the landmines are to avoid. You will develop a better sense of the kinds of monthly and strategic decisions that the forecast can help you answer and influence. Best of all, it is a surprisingly effective tool in helping you increase profitability and improve your cash flow. Your business is profitable… but for some reason your cash is always tight. It almost feels like there’s a cash flow leak somewhere in your business. But you’re not sure where the leak is… or why it’s happening… or how to fix it. Maybe you had to put money into your business recently… and you’re concerned you may have to put more in soon. You’re frustrated because the business should be making distributions to you, not the other way around! With no real answers or solutions, you try to get back to running your business. Yes, that nagging sense of doubt and confusion about your cash flow continues to float around in your head. But you try not to let it drag you down too much. And you try not to let your employees or customers see the worry you are feeling. You would either drop the class or you would find someone to help you figure out the material. Failing the class is not an option, correct? In business, if there is a problem to be solved, and solving it is important to your success (and survival), you either get someone else to solve the problem for you or you solve it yourself. Those are the only two smart options available to you. In this blog post, I’ll introduce you to step one to solving a cash flow problem (or a cash flow mystery). The first step is to create a simple tool to help you understand what’s going on with your cash flow. Once you have a simple understanding of what’s going on with your cash (your money), the path to improving your profitability and cash flow will jump out at you. When you truly understand your cash flow each month, you unlock the door to an amazing new world. You will find financial decisions become easier. You will feel a weight lifted from your shoulders. It even makes it easier to see what’s about to happen financially in your business. You will feel a brand new sense of confidence and control. And best of all, it will free up your energy and unique abilities so you can focus on what you do best in the business. And it all starts with learning a simple approach to understanding your cash flow. If there’s a secret to understanding cash flow, it’s getting laser-focused on simplification. In a strange way, simplification has become a long, lost art in the CPA and bookkeeping community. The financial professionals providing financial statements and tax returns for entrepreneurs and business owners are inadvertently adding to the problem. They are complicating the picture rather than simplifying it. Consider this. You are about to sit down with your banker or your business partner or an investor. You have 2-minutes to briefly explain to them what happened to your cash last month. Not the nitty, gritty, greasy, grimy details. They just want a short, big picture discussion about your cash flow. Your mission is to provide them that understanding while also demonstrating that you know what’s going on in your business financially. Do you stumble and struggle to explain what happened to the cash… and eventually suggest they talk to your accountant or CPA? If so, then they won’t get the basic information they want from you and you’ll look clumsy and weak in the process. That’s a warning sign you should pay very close attention to. I’ll show you how to confidently and credibly explain what happened last month in a way they can understand and relate to… and help you look smart in the process? This is the secret to creating confidence and trust in the minds of those who can help you fund and grow your business. The primary challenge is that the tools created to manage cash flow were developed with accountants in mind… not business owners. But that approach doesn’t work so well because entrepreneurs and accountants don’t think alike. They come at things from a very different perspective. I learned that lesson very early in my career as a CPA and a CFO. I discovered the secret to becoming effective with entrepreneurs was to simplify cash flow down to a non-accountant, common sense, simple message that a business owner can relate to. You will be surprised the insight you get into your cash flow each month by following those three simple steps. After you use the Cash Flow Focus Report for a couple months, something interesting will begin to happen. The mystery around cash flow will start to disappear. And best of all, you will free up more of your time to do the things you really enjoy in the business. I have created a Free Rapid Learning Guide to help you put the Cash Flow Focus Report to work in your business. 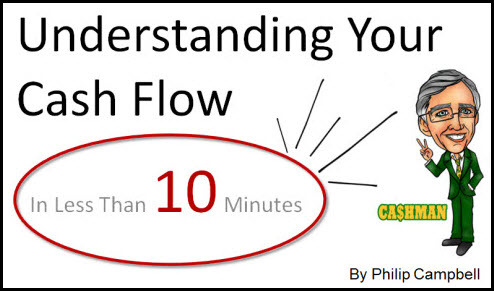 It’s titled Cash Flow Made Simple. You can download it from the free member area. Something about those words just makes you go Hmmmmmm? So what about these two words – Financial Rhythm? Sound strange? Or sound interestingly at home next to each other? For me, the words financial rhythm capture the essence of what financial management in a business is all about. As a seasoned CFO, the words financial rhythm paint a beautiful picture in my head of what driving profitability, cash flow and wealth is all about in a business. A business with an orchestrated financial rhythm in place is a business that takes care of its owners financially. Profits and cash flow are strong. Wealth is being created. Value is being created. Music is being made. There is a pulse, a flow, a cadence at work in the business. The opposite is a business that struggles financially. A business whose finances are disorganized and chaotic. The music it plays sounds more like scratching your fingernails across a chalk board. There is Financial Chaos at work rather than a natural financial rhythm. 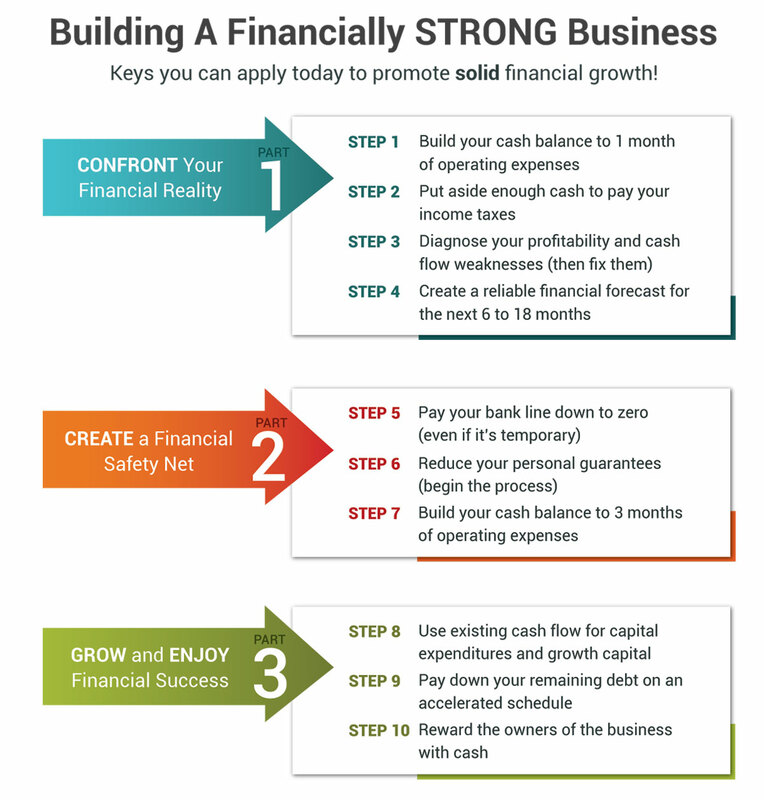 There are three parts to implementing an effective financial rhythm in your business. The 3-Part Plan for creating financial health, wealth, and freedom. 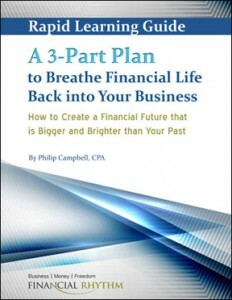 I created a Free Report that shows you this 3-Part Plan and how it can breathe financial life back into your business. You can grab the report with your free membership at Financial Rhythm. The profits, cash flow, net worth cycle. Understanding and managing this cycle wisely is critical to your financial success. Each component plays a different role in creating wealth. 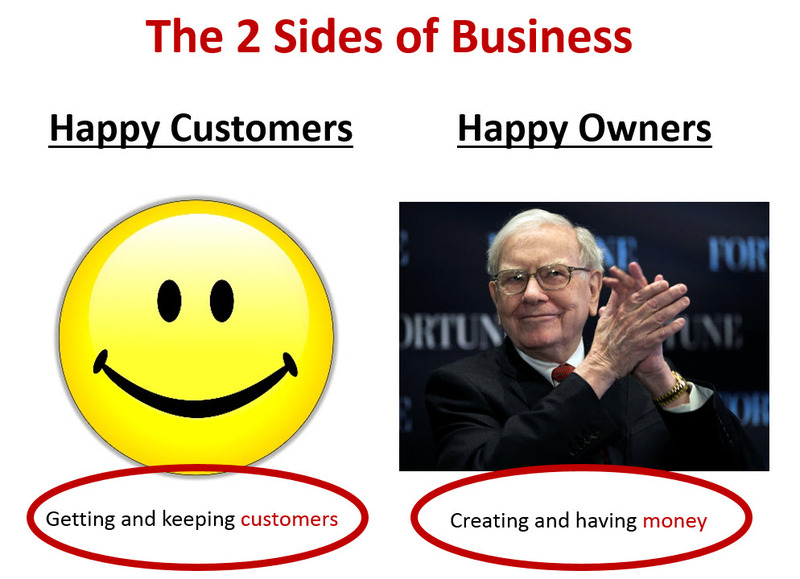 And each component requires specific tactics and strategies in order to create what I like to call Happy Owners (business owners who are creating and enjoying financial success). 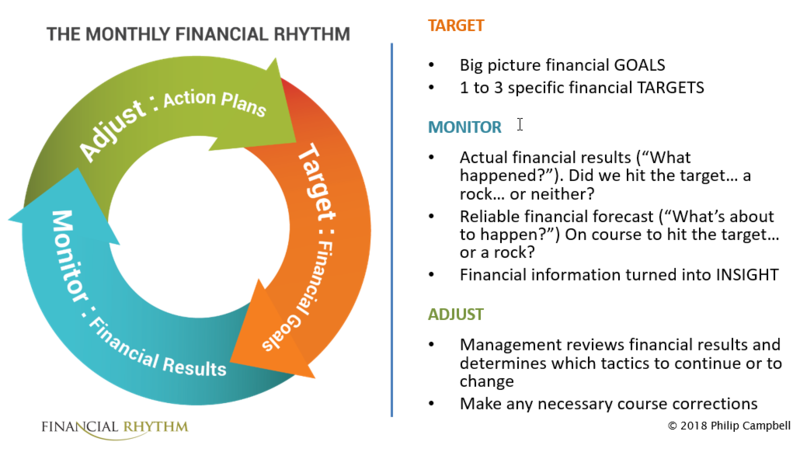 🙂 I will be writing a lot more about how to effectively manage and improve this cycle for the free members here at Financial Rhythm. The Monthly Financial Rhythm is a defined process that ties it all together. It is a systematic and methodical process that operates every month to create order and insight. Here is a blog post that talks about the essence of the Monthly Financial Rhythm. Would Financial Rhythm Be a Good Fit for Your Business? Financial Rhythm is a membership website for people who are serious about creating financial health, wealth, and freedom in their business. If you’re an entrepreneur or business owner, Financial Rhythm is a place to get simple, actionable strategies for creating a financial future that is bigger and brighter than your past. And I deliver it all in the language of the business owner. I have been a CPA for 30 years now. Most of those years in CFO roles. As a CFO, it was my job to work closely with the CEO to help guide the company toward financial success. 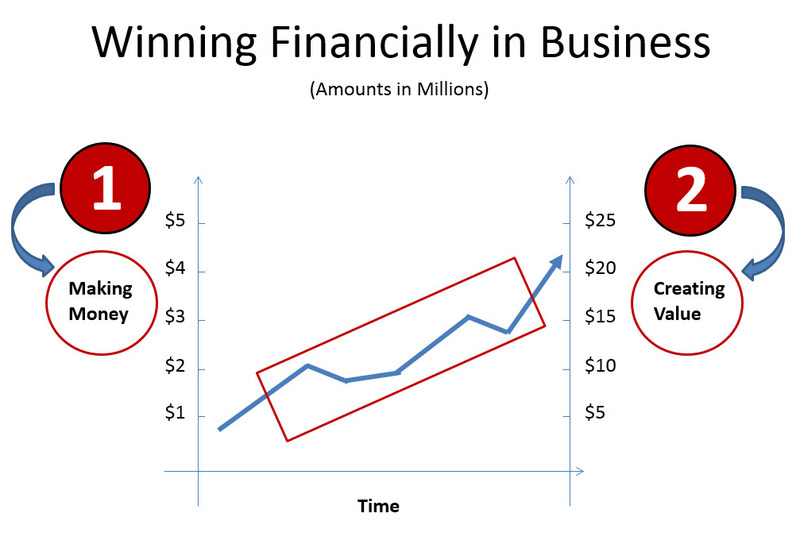 Because it’s impossible to win in business overall without winning financially. Profits and cash flow are the fuel that powers the engine. You can’t be weak financially and expect to create a successful company. You have to be strong. And that requires a very strategic approach to managing the financial side of your business. That’s what Financial Rhythm is all about. Thinking strategically about what you are trying to create (from a financial perspective). Putting a system in place that is smart, effective, and easy to follow. Strategically managing the financial side of your business to create financial health, wealth, and freedom. That’s how you tap into the natural rhythm of business and money. I invite you to accept a free membership to the Financial Rhythm website. It only takes a few seconds to enter your sign up information. Then you’ll get instant access to tips and strategies to help make your business strong financially. All at no cost and no obligation. I believe that making money is good… and having money is even better. Making your business strong financially is not only good, it’s smart. That’s not greed. That’s just recognizing the reality of business. Your business has to be healthy in order for you, your employees and your customers to survive and thrive. Here’s to your financial health, wealth and freedom in your business. Click here to join the free membership area. And for a limited time, in the Free Membership Area you can download a free copy of my book Never Run Out of Cash: The 10 Cash Flow Rules You Can’t Afford to Ignore. When you were a kid, did you have a dream of what you wanted to be when you “grew up”? I did. In fact, three of them. Here is a quick peek into my evolution as a guy who loves business (especially the financial side of business). I had three dreams or visions for my future as I grew up. Here is the short version of each one. First, I wanted to be a rock n roll lead guitar player. I’d have long hair and a van and play huge crowds. I’d be the best guitar player around. I had imagined it vividly in my head. I was a bona fide Rockstar (in my own mind). My Mom never would let me grow my hair long (we had some arguments over that often) but she did buy me a black Les Paul copy one year for Christmas. The problem is I realized in short order that I had no talent with the guitar and I was not coachable. So much for that goal! 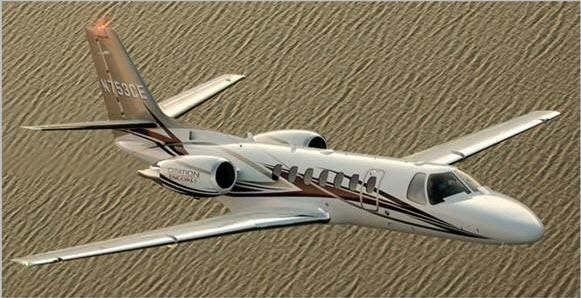 My second dream was to be a corporate jet pilot. I got my pilot’s license when I was 17. I worked (pretty much lived) at the Beaumont Municipal airport (in Beaumont, Texas). I fell in love with corporate jets in the process. On some weekend nights we would rent a Cessna 172 and fly to Houston Hobby airport or to the airport in Jennings, LA. In Jennings, we could taxi over to a parking spot right next to what was then a Holiday Inn and have dinner. It was super cool. We would have dinner then fly back. Great memories. I realized I was not prepared to put in the time to get the hours necessary to start making money as a pilot. And I wasn’t going to the military because it seemed a bit too rigid for me at the time. (My little brother did go the military route and he flies F-16’s in the Air Force and National Guard). I ended up with about 220 flight hours. I got to enjoy being in the sky later in my 40s through skydiving. I have about 150 jumps under my belt. My third dream was to become a business kind of guy and focus on the financial side of business. I’d team up with smart entrepreneurs and provide a unique approach to adding value, creating financial insight (especially around cash flow), and helping them grow a company and make it worth a lot of money (and provide an outstanding product or service to customers at the same time). I’d be a CPA who understood the business owner’s perspective. I’d be a CFO that could help a business owner create a great company that was a success financially. I wouldn’t be a typical accountant. Now that’s fun. I found my niche!!! Focusing intently on adding value, and owning a piece of the companies I work with, has worked out very well for me. I can’t tell you how much I enjoy working with smart entrepreneurs and business owners. Let me know if you are one of those smart entrepreneurs I love to team up with.